Shaw scored 94 off just 100 deliveries in the opening game against Australia. Sachin Ramesh Tendulkar – it is not just his numbers and records which ruled the World of Cricket but his masterclass. The legend’s classy strokeplay has always been a treat to watch. Though it has been a while since the master blaster announced his retirement, no one could match the maestro’s level. Fans thoroughly enjoyed every shot of his. However, the Mumbaikar’s drives, especially the straight and cover drives, have always been cherished. The Indian Junior team started off their ICC U19 World Cup quite well. The youngsters decided to bat first after winning the toss and posted a massive 328 on board. Leading from the front, the skipper Prithvi Shaw scored a brilliant 94 with 8 fours and two sixes. The opener added 180 odd runs for the first wicket along with his partner, Manjot Kalra. Manjot amassed 86 runs and his knock included 12 fours and 1 sixes. Prithvi Shaw, the young Mumbaikar reminded everyone of the master blaster with his classy strokeplay. One of his flamboyant drives resembled so much with the God of Cricket. The youngster made it look so simple yet so mesmerizing, just the way Sachin always did it. It wasn’t just the fans, Prithvi’s glorious drive impressed the Carribean commentator – Ian Bishop as well. ‘That is Tendulkar’, Ian Bishop exclaimed in Joy while he saw Shaw’s brilliant stroke. Despite a splendid opening stand, both the opening batsmen couldn’t reach the hundred mark. However, with the platform set, Shubman Gill took care of the rest. Coming after the skipper’s dismissal at 180, Gill curtailed the Indian inning towards a decent total. He scored a 63 with six fours and a six. Gill’s knock ended after being caught and bowled by Jack Edwards in the 46th over. Abhishek Sharma made sure of a massive total with a cameo of 23 of 8 towards the end. Jack Edwards was the best bowler for the Aussies, he picked four wickets giving away 65 runs in his 9 overs. However, Will Sutherland – son of former Cricket Australia CEO James Sutherland provided Australia with the first breakthrough. Shaw was caught off Will at just six runs short of a century. 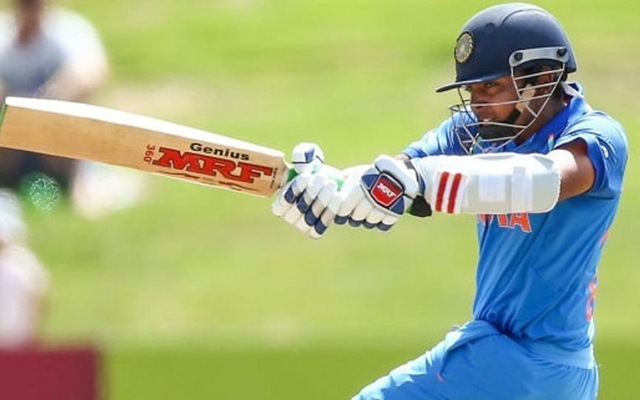 #PrithviShaw please please be that special player everyone is expecting you to be..
Prithvi shaw reminds so much of sachin tendulkar. Even he got dismissed on nervous nineties.#U19CWC ? Prithvi shaw’s elegance and bat flow reminds me and @OneTipOneHand_ of Sachin Tendulkar.